Fall is upon us, and with it comes the busy market/fair season. I'll be making lots of things to bring with me, and hopefully taking pictures of them all. I've got good motivation to do it, since my daughter is studying abroad and she wants to see the things I've made. During the summer markets she always comes with me and knows my inventory very well. When she left she told me I'd need to blog a lot so she could see all my new stuff. 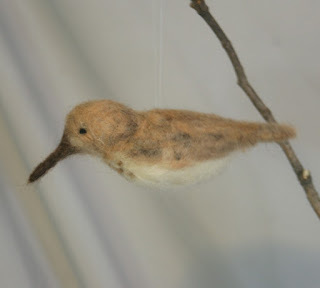 This is a sandpiper a customer ordered. It was fun to make, as I've never made one before. I found 3 sweaters in the same design at the thrift shop last week, a blue, a yellow and a red one. They were all the same size, from the same store, and shrunk similarly, so I figure they all came from the same person who forgot not to put them in the dryer. Oops for them, but I'm grateful! 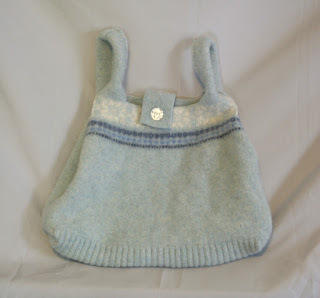 So here's the blue one, turned into a bag. I found a huge cardigan in a great pattern, and here's what I was able to make out of it, along with a bunch of treasure bags: 2 pairs of mittens, a set of potholders, and some wrist warmers. Here are the birds I made this past weekend. 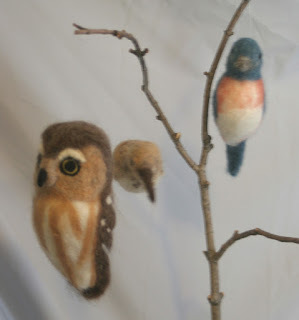 The saw-whet and the bluebird are popular ones that I make a couple of times a month. That's it for today. We'll see if I can get more on tomorrow.